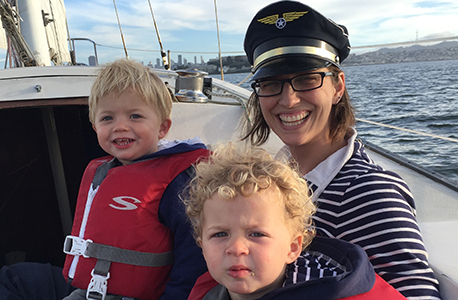 YouNoodle COO Adele Burnes with her twin boys. Yup, I said it – being a mom makes me a BETTER entrepreneur and executive. In becoming a mom, I’m not leaning back, I’m stepping up my game. While I may not have anticipated this, it is 100% true. I have worked at YouNoodle for almost 5 years, and after 3 years of creating, building and leading up the Client Happiness team, I had twin boys and went on maternity leave for 6 months (yup, our policy, which I created, is that awesome) after which I returned and was promoted to Chief Operating Officer. Having twins, while bonkers, forced me to further develop some incredibly important skills from day one – building a killer team and asking for help. As we have all heard, raising a kid takes a village. In some cases, people actually have a village with parents and siblings and aunts and uncles to step up and fill in. Both my husband and I are from far away, where our families still reside. Therefore in becoming a mom, I have gotten really good at asking for help and building a killer team. I quickly realized that I needed a lot of help, and sometimes I have to pay for that help and sometimes I just need to be bold enough to ask for it. All happiness and success comes from building an amazing team, training that team to get them up to speed, and then stepping back to let them work their magic. Hiring is absolutely the most important thing I do as executive at a startup and as a mom. When hiring a nanny, I noticed that I needed to do 2 things, follow my own instinct about the person, and also let my kids interview them and take their input as extremely valuable. Yes, I had my 5 month old babies interview potential nannies, and their emotional response was clearly observable and very meaningful. Likewise, I have brought this skill to work, where I have learned how quick and surprisingly accurate my hiring instinct has become. Similarly, I try to involve as many people as possible in the interviewing and hiring process, because the team has to be super excited about a new hire and without their buy in, the hire will never be successful. It doesn’t matter how many children’s science books you have written or how many enterprise deals you have closed, if you do not get a positive emotional response from the team, magic is not going to happen. When starting a company or managing a scrappy early stage startup, you need to get really good at asking for help. When preparing to give birth to twins and looking at the road ahead of maternity leave with infant twins, I knew I needed all hands on deck. I lined up family members to visit, and in the gaps between family visitors I knew I needed friends. All those people that had said, “Oh wow! Twins! Let me know if I can ever help, I love babies.” I emailed ALL of them – careful what you offer. I gave days and timeslots that I needed help and people signed up. It was such a good idea, and so many people showed up and were just amazing and it was so critical to my sanity and survival. Managing a scrappy startup, I also have learned that you need to just share your idea with people and when they seem enthusiastic about your baby, I mean your startup, be sure to take them up on that offer. Let them know what you are struggling with and they just might have some brilliant advice, or know someone that could give you valuable input and of course, always follow up on that offer for an investor or client intro. But most importantly, share your startup and let people into your struggle and ask for help, and so often people will show up in ways that you may not have anticipated. Being a mother is a wild ride but make no mistake that it steps up your game. Too often there is a narrative of either/or with being a mom and thriving in your career, and I have found that the truth is actually the opposite. As an entrepreneur and startup executive, being a parent has been an advantage and helped me develop much needed skills for family and startup success. Actually I have a lot more thoughts on this, so look out for Part 2. A Truly Global Startup Revolution. A Case for Diversity in the Workplace.